Rooftop excavators? On my multistory highrise building? It’s more likely than you think, especially in China where painting one’s self into a corner is no longer just for painters anymore. The difference here is, the corner in question could be several hundred feet above the ground. 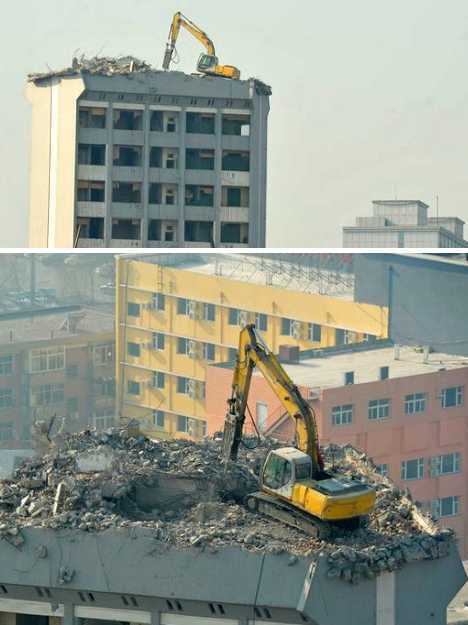 Hydraulic excavators are often used in Chinese demolition projects to quickly bring down roofs. 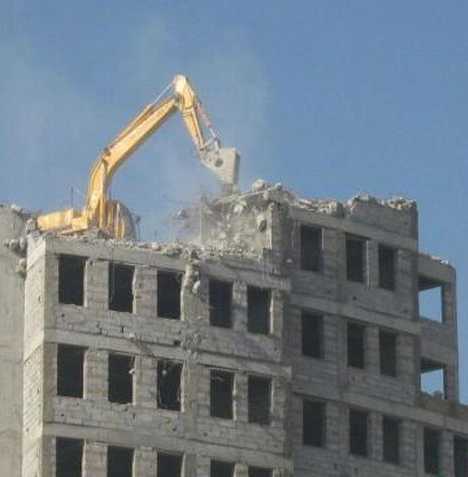 This can be somewhat problematic when the roof – and the building beneath it – just happens to be supporting the multi-ton excavator being used to do the demolition. Consider also that high-rise roofs aren’t designed to support great concentrations of weight, and the roofs doing the supporting belong to buildings being knocked down because (generally) they’re having trouble staying up. 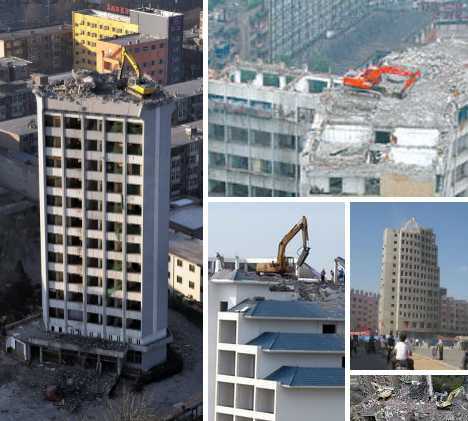 The situation is even more problematic in China, where a combination of lax workplace safety laws and shoddy construction has given rise to a world where buildings are slapped together, sold, condemned and torn down – often within just a few short years. 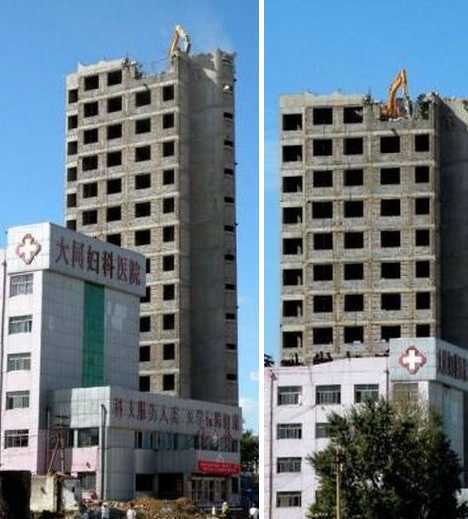 Sometimes the buildings don’t wait for the demolition men: what goes up too quickly, often comes down even quicker. 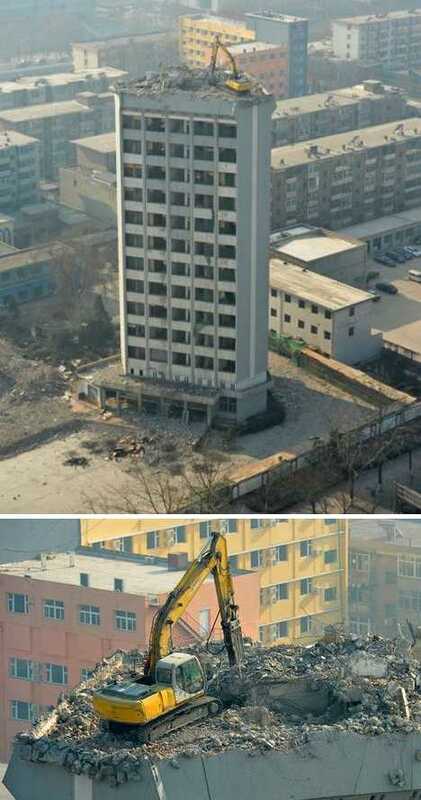 Here’s a lone excavator hard at work on top of the 12-story Shanxi Science and Technology Hotel in the Chinese city of Taiyuan. The slender, triangular building has a very limited amount of roof space in which the excavator’s driver can manoeuvre, yet manoeuvre he must if the building is going to be eaten away down to ground level. Click here to watch a short video from CNS News that shows the rooftop excavation project from various angles, including from the roof itself. It’s in Chinese but as they say, a picture’s worth a thousand words! 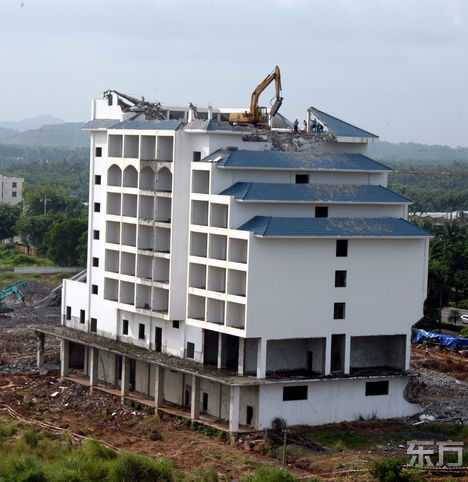 One assumes that the excavator claws a certain amount of material from one side of the roof, and then drives over to the reduced area and does the same to the place he just left, over and over again. Alternatively, a ground-based crane might just pick up the excavator and plop it down (not too hard!) on another portion of the roof. It’s not rocket science, though working atop an unsteady platform honeycombed with rooms and open areas may still end up with the worker flying through space. Readers surely must be asking, “why not just dynamite the building such that it collapses in on itself?” Ask any expert, controlled demolition is a precise and delicate operation which, if unsuccessful, cold result in extensive collateral damage to surrounding buildings and nearby construction workers – not to mention TONS of dust to sweep up. 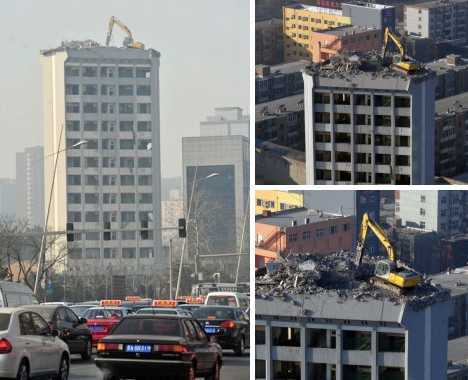 Believe it or not, in China at least, demolition via rooftop excavator is the safer, cleaner, and above all cheaper option. 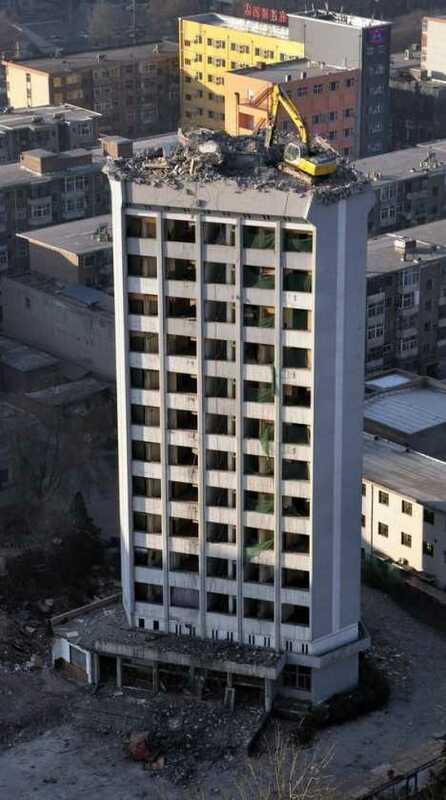 The 18-story residential apartment building depicted here in mid-demolition a few weeks ago was built in the city of Taizhou, located in eastern China’s Zheijiang Province… in January of 2011! Yes indeed, the highrise didn’t even last one full year before the ground beneath it began settling unevenly, eventually causing the building (and several others nearby) to be deemed unsafe. 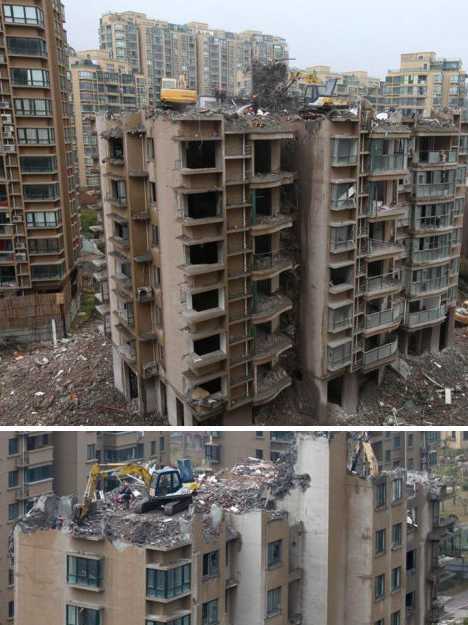 Consider the plight of a Mr. Zhan, who bought a unit on the building’s 16th floor yet had to move out just 17 hours after moving in when a structural support pillar cracked. 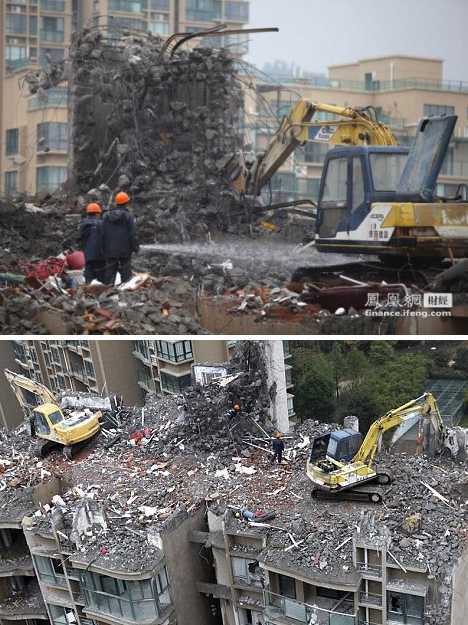 “I heard loud banging sounds like an explosion,” explained Zhan to reporters from China Daily, “it was really scary. I bought my unit because of the beautiful ocean view. 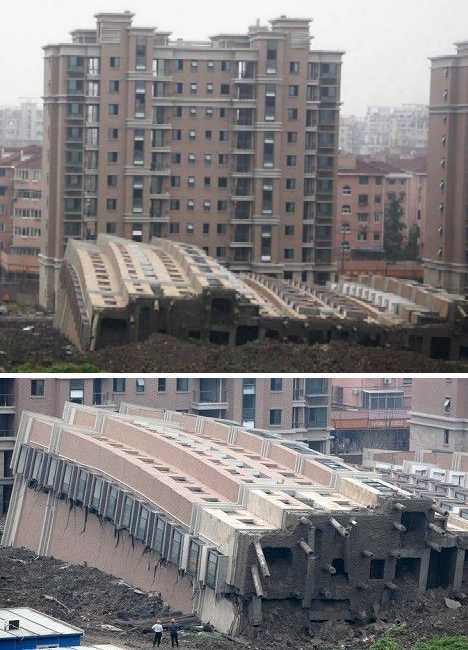 It’s such a pity I can’t live in it.” Hope you’ve got Collapsing Building Insurance, Zhan. 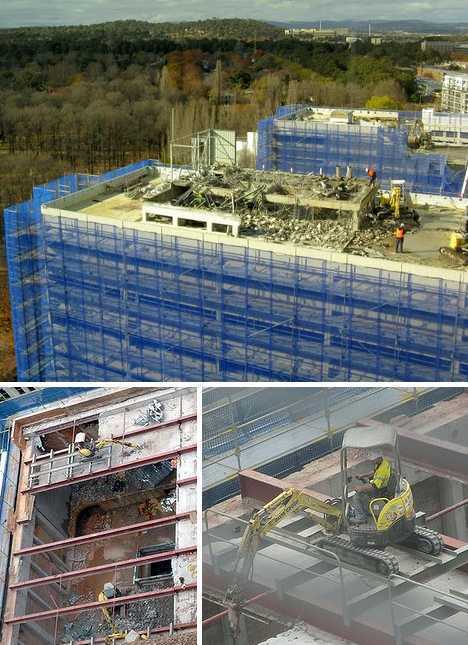 Rooftop excavation is not exclusive to China, it seems, as these images from several demolition projects in Australia indicate. 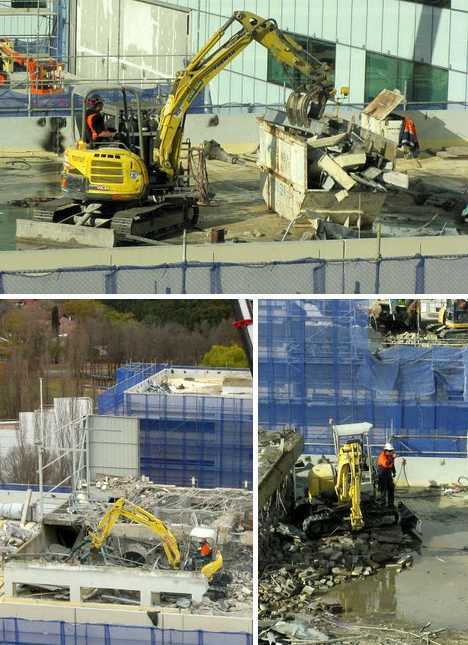 The above scene from earlier this year showed demolition underway in central Canberra. 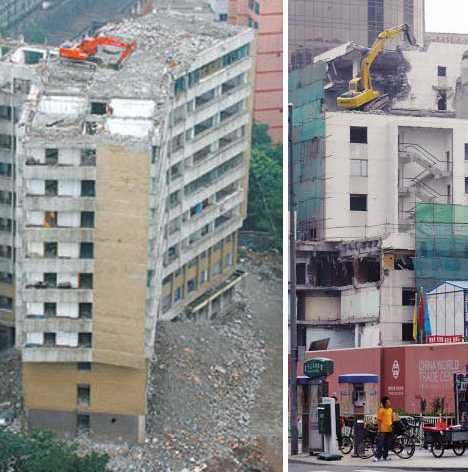 Unlike similar building demolitions in China, however, the Aussies use smaller excavators on lower buildings which are wrapped in protective covers to corral debris. Rooftop Excavators, How Do They Work? 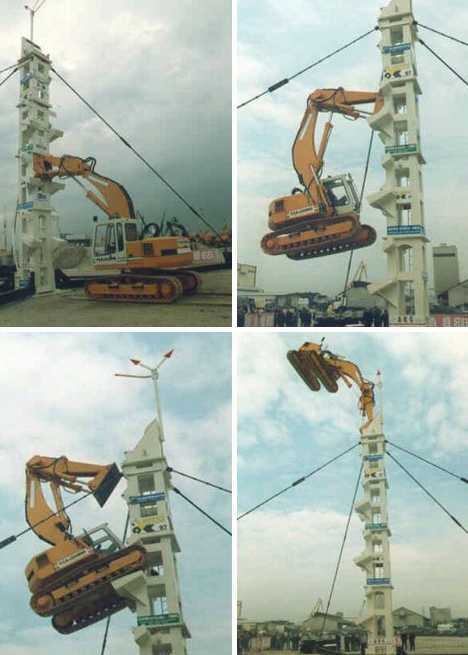 You might be wondering how these huge hydraulic excavators get up to their precarious perches in the first place. Giant helicopters? The service elevator? Disassembled, brought to the roof and reassembled? 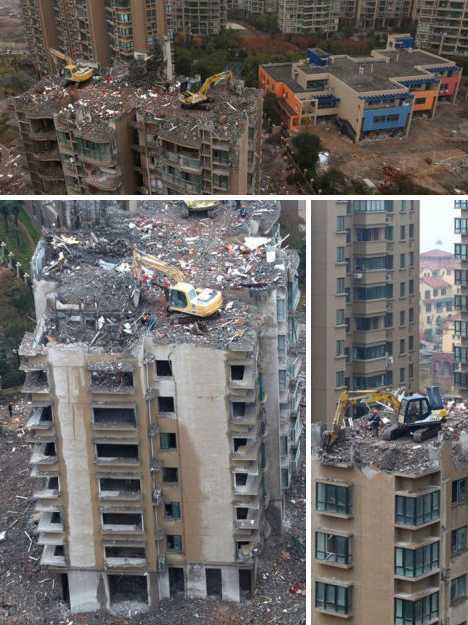 Maybe each highrise was built with an excavator entombed on the roof in anticipation of its eventual demolition, or perhaps the excavators simply climb up the balconies, floor by floor. 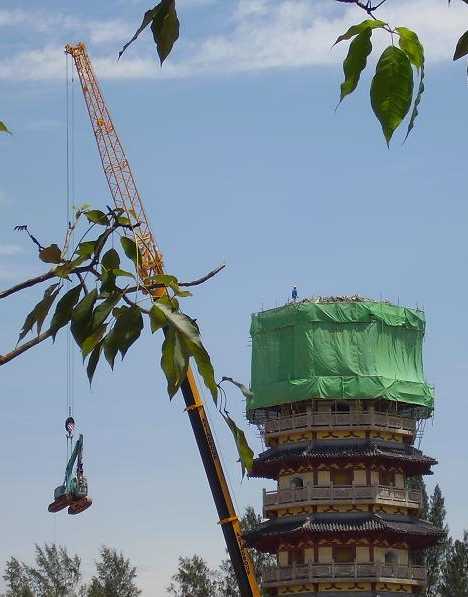 Actually, if the building isn’t too high the excavators can be lifted to the top by much larger, ground-based construction cranes as shown above. 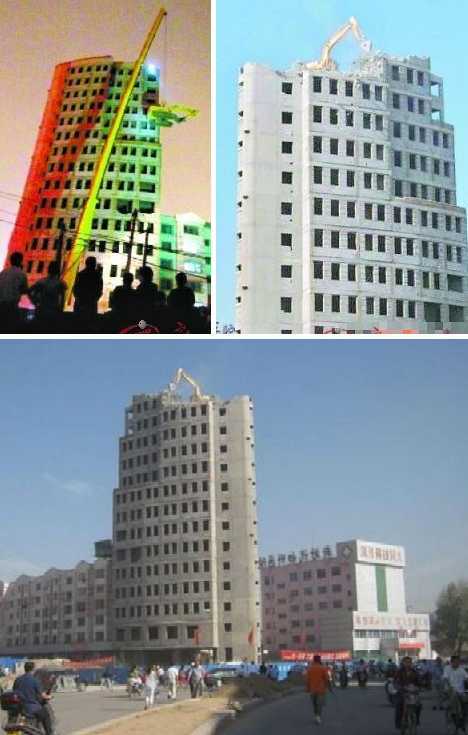 The ground-based cranes are designed to lift, not dig, so using them to reduce the heights of condemned buildings is not a viable option. Once in place up on the roof, it’s dig, dig and dig some more… which leads to the next question: where does all the excavated dirt and debris go, especially in a crowded urban environment like that of Datong City in China’s Shanxi province? Either it’s going down the central elevator shaft, or (more likely) dumped over the side. A word of advice: if you wake up one morning, look out your window and see an excavator of the roof of the neighboring building, be sure to wear your hard hat before walking out your front door. Better yet, call in sick and don’t go out at all lest a rooftop excavator turn you into an ex-person.